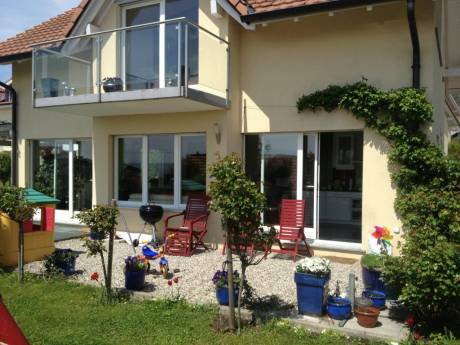 Our home is a nice and sunny house with a 1500sqm closed garden where you can enjoy the sun and barbecue. Nice for children with table tennis and soccer goals. Inside you have 4 sunny bedrooms upstairs and downstairs a large kitchen and spacious living room.You can enjoy the terrace for the barbecue.We have bikes for 4 adults and various smaller bikes for children. Family of 4 with twin boys of 17, we enjoy outdoor activities as well as discovering other cultures in all parts of the world. We have two little cats that we love and who will miss us when we will be away. We are planning for an exchange for two or three weeks next summer preferably in Istanbul but we are open to all proposals. The house is located in the villa area of a quiet small town with all amenities: bakery, supermarket, restaurants... Our house is close to the Geneva lake good in summer for swimming and boat tours; for biking and jogging you have the nearby woods. In less than one hour you can hike in the Jura mountains or head to Chamonix and the Mont Blanc or spend a night in a refuge (we can provide recomendations). Paris is only 3h away by speed train. A large number of european cities can be reached with Easyjet or other low cost airlines.